What Population Spends the Most on US Home Purchases? | ASTRALCOM - Content Strategy, Conversion Marketing and Customer Acquisition. What Population Spends the Most on US Home Purchases? A recent report released data on differing spending habits of property buyers for homes in the USA. The report was published by the National Association of Realtors. 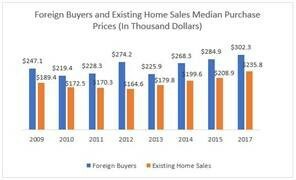 It reveals that foreign consumers typically spend 30% to 50% more on US home purchases when compared to local buyers. According to the report, the average price of a property purchased by a foreign investor stood at about $536,000. Those purchased by American buyers averaged slightly over the $270,000 mark. The median price stood at about $300,000 and $235,000 for foreigners and locals respectively. This gap has continually widened with each passing year. These figures also represent a new high in the amount of foreign investment in US homes. Analysts have attributed this phenomenon to different factors. A key determinant is the rise of the Chinese economy. This purchasing ability is shown in their spending habits. They were ranked highest among foreign nationals who purchased the most expensive homes in the US. Chinese buyers have shown a tendency to buy residential properties in areas with higher property values. These include homes in California, New York, and New Jersey. Canadian buyers also represented a large segment of foreign investment of more than $19 billion. This was also a new high. In a one-year period, foreign buyers purchased more than $150 billion in residential real estate property. This represents a 49% increase from the previous year. The report also pointed out that foreigners were more likely to purchase US home properties in cash. Domestic buyers’ primary means of purchase was home mortgages. Over 70% of international buyers, compared to approximately 35% of American investors, made their purchases in cash. More details from the NAR report can be found here. Trends in the homebuilding market are ever changing. ASTRALCOM has been a leader in helping homebuilders stay on top of developing trends. We help homebuilders to connect with more buyers and sell more homes. We do this by creating digital customer experiences which are inspiring, engaging and informative. Visit us to find out more or to contact us for a free consultation today. How Often Should Brands Publish Content?